Hi Rachel, Suzanne and Ciara. 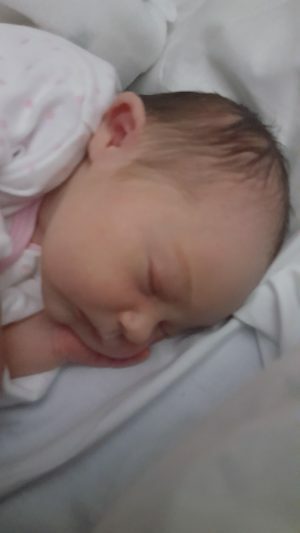 April James Doyle was born bang on her due date of 19 April weighing 6lb 6oz of pure cuteness. She took a while to decide whether she was ready to come into the world with 2 long days of early labour at home and 23 hours in the hospital. Came into hospital tue night at 2am but was still awhile off but stayed the night anyway. Once baby had made up her mind to get going on Wed morning, the doc helped her along by breaking waters. Was almost ready to start heading towards the delivery room at 12pm when lots of other babies had the same idea as April and the delivery room became very full and had to join the queue of further along mamas (witnessing a birth in the communal room in the meantime which was both amazing and terrifying!). By the time I thankfully got to the delivery room at 4pm I was exhausted and was so relieved when the epidural angel appeared. I came alive again and everything was very smooth sailing from there on in and moved a lot faster than expected. The midwife was absolutely stunned when April catapulted out head and body in one go after 20 mins of easy pushing. I credited my yoga classes for this one…all the squats and kegels paid off! 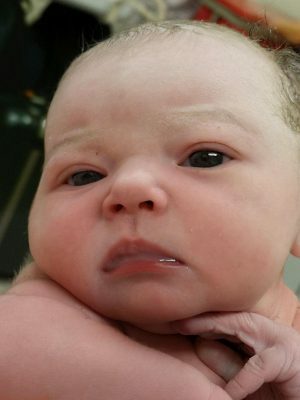 April was born at 12.56am with eyes wide open. Thank you all so much for the support and guidance over the last 4 months. I learned so much in the classes from shared stories and really helped make pregnancy a wonderful experience!! Hope to be back for some Mommy baby massage and yoga when we are ready to venture into town. Thanks again. Laura D and baby April.